Libby (Neve McIntosh) is a middle-aged frustrated playwright and has decided to fling herself off Edinburgh’s Salisbury Crags but Declan (Lorn Macdonald), an unemployed 17-years old, saves her. Two persons with completely different backgrounds and hopes. Libby likes very much Declan’s drawings – so much that she goes back to look for him, offering him presents: she wants to be a mentor and a friend, and to initiate him to art, museums and theatre. The new friendship (with some physical attraction) seems unlikely, but the two start to spend time together, and Libby is fascinated by the stories of abuse and poverty experienced by Declan. Then, Libby has an idea: can Declan’s struggles be used to create a play that could change her career forever? She wants, she needs his story. But does she have the right to it? Mouthpiece is a modern and self-reflexive piece of theatre with an original message at its centre. 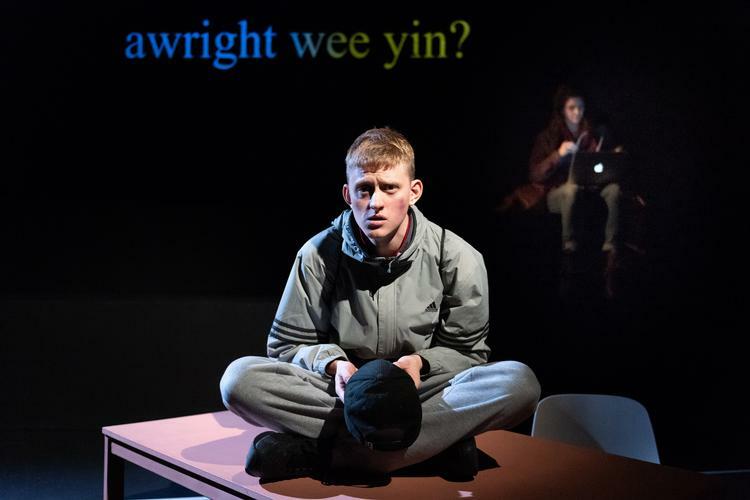 While Declan is a concentrate of emotional energy, but also vulnerability, perfectly displayed by Lorn, the character of Libby feels weaker and less authentic; it is not clear what the drive of her actions is. Kieran Hurley’s Mouthpiece, directed by Orla O’Loughlin, is fast-paced, with a lot of refreshing humour. The wordy script is made even more central by the simplicity of the stage and of the lighting. It raises important questions about authenticity, cultural appropriation, social disparity, mental health, access to the arts, the purpose of theatre. It is theatre that talks about theatre. Probably too much to be explored in 90 minutes. But it is provocative and engaging and will make you question everything.